This news item was posted in Genetic, Liver, Lung, T category and has 0 Comments so far. Tuberculosis (TB) is an infectious disease caused by bacteria whose scientific name is Mycobacterium tuberculosis. It was first isolated in 1882 by a German physician named Robert Koch who received the Nobel Prize for this discovery. TB most commonly affects the lungs but also can involve almost any organ of the body. Many years ago, this disease was referred to as “consumption” because without effective treatment, these patients often would waste away. Today, of course, tuberculosis usually can be treated successfully with antibiotics. There is also a group of organisms referred to as atypical tuberculosis. These involve other types of bacteria that are in the Mycobacterium family. Often, these organisms do not cause disease and are referred to as “colonizers” because they simply live alongside other bacteria in our bodies without causing damage. At times, these bacteria can cause an infection that is sometimes clinically like typical tuberculosis. When these atypical mycobacteria cause infection, they are often very difficult to cure. Often, drug therapy for these organisms must be administered for one and a half to two years and requires multiple medications. A person can become infected with tuberculosis bacteria when he or she inhales minute particles of infected sputum from the air. The bacteria get into the air when someone who has a tuberculosis lung infection coughs, sneezes, shouts, or spits (which is common in some cultures). People who are nearby can then possibly breathe the bacteria into their lungs. You don’t get TB by just touching the clothes or shaking the hands of someone who is infected. Tuberculosis is spread (transmitted) primarily from person to person by breathing infected air during close contact. There is a form of atypical tuberculosis, however, that is transmitted by drinking unpasteurized milk. Related bacteria, called Mycobacterium bovis, cause this form of TB. Previously, this type of bacteria was a major cause of TB in children, but it rarely causes TB now since most milk is pasteurized (undergoes a heating process that kills the bacteria). 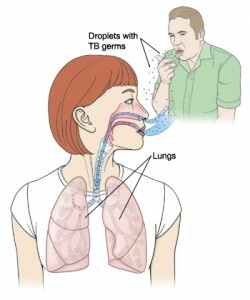 In addition, TB can spread to other parts of the body. The body’s immune (defense) system, however, can fight off the infection and stop the bacteria from spreading. The immune system does so ultimately by forming scar tissue around the TB bacteria and isolating it from the rest of the body. Tuberculosis that occurs after initial exposure to the bacteria is often referred to as primary TB. If the body is able to form scar tissue (fibrosis) around the TB bacteria, then the infection is contained in an inactive state. Such an individual typically has no symptoms and cannot spread TB to other people. The scar tissue and lymph nodes may eventually harden, like stone, due to the process of calcification of the scars (deposition of calcium from the bloodstream in the scar tissue). These scars often appear on X-rays and imaging studies like round marbles and are referred to as a granuloma. If these scars do not show any evidence of calcium on X-ray, they can be difficult to distinguish from cancer. Sometimes, however, the body’s immune system becomes weakened, and the TB bacteria break through the scar tissue and can cause active disease, referred to as reactivation tuberculosis or secondary TB. For example, the immune system can be weakened by old age, the development of another infection or a cancer, or certain medications such as cortisone, anticancer drugs, or certain medications used to treat arthritis or inflammatory bowel disease. The breakthrough of bacteria can result in a recurrence of the pneumonia and a spread of TB to other locations in the body. The kidneys, bone, and lining of the brain and spinal cord (meninges) are the most common sites affected by the spread of TB beyond the lungs. How common is TB, and who gets it? Over 8 million new cases of TB occur each year worldwide. In the United States, it is estimated that 10-15 million people are infected with the TB bacteria and 22,000 new cases of TB occur each year. As previously mentioned, TB infection usually occurs initially in the upper part (lobe) of the lungs. The body’s immune system, however, can stop the bacteria from continuing to reproduce. Thus, the immune system can make the lung infection inactive (dormant). On the other hand, if the body’s immune system cannot contain the TB bacteria, the bacteria will reproduce (become active or reactivate) in the lungs and spread elsewhere in the body. It may take many months from the time the infection initially gets into the lungs until symptoms develop. The usual symptoms that occur with an active TB infection are a generalized tiredness or weakness, weight loss, fever, and night sweats. If the infection in the lung worsens, then further symptoms can include coughing, chest pain, coughing up of sputum (material from the lungs) and/or blood, and shortness of breath. If the infection spreads beyond the lungs, the symptoms will depend upon the organs involved. TB can be diagnosed in several different ways, including chest X-rays, analysis of sputum, and skin tests. Sometimes, the chest X-rays can reveal evidence of active tuberculosis pneumonia. Other times, the X-rays may show scarring (fibrosis) or hardening (calcification) in the lungs, suggesting that the TB is contained and inactive. Examination of the sputum on a slide (smear) under the microscope can show the presence of the tuberculosis-like bacteria. Bacteria of the Mycobacterium family, including atypical mycobacteria, stain positive with special dyes and are referred to as acid-fast bacteria (AFB). A sample of the sputum also is usually taken and grown (cultured) in special incubators so that the tuberculosis bacteria can subsequently be identified as tuberculosis or atypical tuberculosis. Several types of skin tests are used to screen for TB infection. These so-called tuberculin skin tests include the Tine test and the Mantoux test, also known as the PPD (purified protein derivative) test. In each of these tests, a small amount of purified extract from dead tuberculosis bacteria is injected under the skin. If a person is not infected with TB, then no reaction will occur at the site of the injection (a negative skin test). If a person is infected with tuberculosis, however, a raised and reddened area will occur around the site of the test injection. This reaction, a positive skin test, occurs about 48-72 hours after the injection. When only the skin test is positive, or evidence of prior TB is present on chest X-rays, the disease is referred to as “latent tuberculosis.” This contrasts with active TB as described above, under symptoms. If the infection with tuberculosis has occurred recently, however, the skin test can be falsely negative. The reason for a false-negative test with a recent infection is that it usually takes two to 10 weeks after the time of infection with tuberculosis before the skin test becomes positive. The skin test can also be falsely negative if a person’s immune system is weakened or deficient due to another illness such as AIDS or cancer, or while taking medications that can suppress the immune response, such as cortisone or anticancer drugs. Remember, however, that the TB skin test cannot determine whether the disease is active or not. This determination requires the chest X-rays and/or sputum analysis (smear and culture) in the laboratory. The organism can take up to six weeks to grow in culture in the microbiology lab. A special test to diagnose TB called the PCR (polymerase chain reaction) detects the genetic material of the bacteria. This test is extremely sensitive (it detects minute amounts of the bacteria) and specific (it detects only the TB bacteria). One can usually get results from the PCR test within a few days. Is there a vaccine against tuberculosis? Bacille Calmette Guérin, also known as BCG, is a vaccine given throughout many parts of the world. It is derived from an atypical Mycobacterium but offers some protection from developing active tuberculosis, especially in infants and children. This vaccination is believed to be important in parts of the world where TB is quite common. This is not the case in the United States. When BCG has been administered, future PPD and Tine skin tests remain positive and can cause some confusion when trying to diagnose TB. It is also important to realize that even with a BCG vaccine in childhood, tuberculosis can still occur in an adult exposed to the tuberculosis bacteria, which calls into question the real utility and effectiveness of this vaccination. A new blood test is now available that can help distinguish between a prior BCG vaccine and a positive PPD due to TB infection. This test involves mixing the patient’s blood with substances that produce a TB-like immune response. After a period of time, the immune cells, if infected with TB, produce interferon-gamma, a protein produced by the body to defend against an infection. This test, like most, is not perfect, but with the proper clinical information can help distinguish a real TB infection from a positive reaction on the test due to a prior BCG vaccine. A person with a positive skin test, a normal chest X-ray, and no symptoms most likely has only a few TB germs in an inactive state and is not contagious. Nevertheless, treatment with an antibiotic may be recommended for this person to prevent the TB from turning into an active infection. The antibiotic used for this purpose is called isoniazid (INH). If taken for six to 12 months, it will prevent the TB from becoming active in the future. In fact, if a person with a positive skin test does not take INH, there is a 5%-10% lifelong risk that the TB will become active. Taking isoniazid can be inadvisable (contraindicated) during pregnancy or for those suffering from alcoholism or liver disease. Also, isoniazid can have side effects. The side effects occur infrequently, but a rash can develop, and the individual can feel tired or irritable. Liver damage from isoniazid is a rare occurrence and typically reverses once the drug is stopped. Very rarely, however, especially in older people, the liver damage (INH hepatitis) can even be fatal. It is important therefore, for the doctor to monitor a patient’s liver by periodically ordering blood tests called “liver function tests” during the course of INH therapy. Another side effect of INH is a decreased sensation in the extremities referred to as a peripheral neuropathy. This can be avoided by taking vitamin B6 (pyridoxine), and this is often prescribed along with INH. A person with a positive skin test along with an abnormal chest X-ray and sputum evidencing TB bacteria has active TB and is contagious. As already mentioned, active TB usually is accompanied by symptoms, such as a cough, fever, weight loss, and fatigue. Active TB is treated with a combination of medications along with isoniazid. Rifampin (Rifadin), ethambutol (Myambutol), and pyrazinamide are the drugs commonly used to treat active TB in conjunction with isoniazid (INH). Four drugs are often taken for the first two months of therapy to help kill any potentially resistant strains of bacteria. Then the number is usually reduced to two drugs for the remainder of the treatment based on drug sensitivity testing that is usually available by this time in the course. Streptomycin, a drug that is given by injection, may be used as well, particularly when the disease is extensive and/or the patients do not take their oral medications reliably (termed “poor compliance”). Treatment usually lasts for many months and sometimes for years. Successful treatment of TB is dependent largely on the compliance of the patient. Indeed, the failure of a patient to take the medications as prescribed is the most important cause of failure to cure the TB infection. In some locations, the health department demands direct monitoring of patient compliance with therapy. Surgery on the lungs may be indicated to help cure TB when medication has failed, but in this day and age, surgery for TB is unusual. Treatment with appropriate antibiotics will usually cure the TB. Without treatment, however, tuberculosis can be a lethal infection. Therefore, early diagnosis is important. Those individuals who have been exposed to a person with TB, or suspect that they have been, should be examined by a doctor for signs of TB and screened with a TB skin test. Drug-resistant TB (TB that does not respond to drug treatment) has become a very serious problem in recent years in certain populations. For example, INH-resistant TB is seen among patients from Southeast Asia. The presence of INH-like substances in the cough syrups in that part of the world may play a role in causing the INH resistance. Drug-resistant cases are also often seen in prison populations. However, the major reason for the development of resistance is poorly managed TB care. This can result from poor patient compliance, inappropriate dosing or prescribing of medication, poorly formulated medications, and/or an inadequate supply of medication. Multidrug-resistant tuberculosis (MDR-TB) refers to organisms that are resistant to at least two of the first-line drugs, INH and Rifampin. More recently, extensively (extremely) drug resistant tuberculosis (XDR-TB) has emerged. These bacteria are also resistant to three or more of the second-line treatment drugs. XDR-TB is seen throughout the world but is most frequently seen in the countries of the former Soviet Union and Asia. Preventing XDR-TB from spreading is essential. The World Health Organization (WHO) recommends improving basic TB care to prevent emergence of resistance and the development of proper laboratories for detection of resistant cases. When drug-resistant cases are found, prompt, appropriate treatment is required. This will prevent further transmission. Collaboration of HIV and TB care will also help limit the spread of tuberculosis, both sensitive and resistant strains. What’s in the future for TB? Conceivably, TB could have been eliminated by effective treatment, vaccinations, and public-health measures by the year 2000. However, the emergence of HIV changed the whole picture. Because of HIV, a tremendous increase in the frequency (incidence) of TB occurred in the ’80s and throughout the ’90s. This increase in TB happened because suppression of the body’s immune (defense) system by HIV allowed TB to occur as a so-called opportunistic infection. With the increasing HIV epidemic in Africa, serious concerns are being raised about the development of MDR-TB and XDR-TB in this population. Hopefully, control of HIV in the future will check this resurgence of tuberculosis. * Tuberculosis (TB) is an infection, primarily in the lungs (a pneumonia), caused by bacteria called Mycobacterium tuberculosis. It is spread usually from person to person by breathing infected air during close contact. * TB can remain in an inactive (dormant) state for years without causing symptoms or spreading to other people. * When the immune system of a patient with dormant TB is weakened, the TB can become active (reactivate) and cause infection in the lungs or other parts of the body. * The risk factors for acquiring TB include close-contact situations, alcohol and IV drug abuse, and certain diseases (for example, diabetes, cancer, and HIV) and occupations (for example, health-care workers). * The most common symptoms of TB are fatigue, fever, weight loss, coughing, and night sweats. * The diagnosis of TB involves skin tests, chest X-rays, sputum analysis (smear and culture), and PCR tests to detect the genetic material of the causative bacteria. * Inactive tuberculosis may be treated with an antibiotic, isoniazid (INH), to prevent the TB infection from becoming active. * Active TB is treated, usually successfully, with INH in combination with one or more of several drugs, including rifampin, ethambutol, pyrazinamide, and streptomycin. * Drug-resistant TB is a serious, as yet unsolved, public-health problem, especially in Southeast Asia, the countries of the former Soviet Union, Africa, and in prison populations. Poor patient compliance, lack of detection of resistant strains, and unavailable therapy are key reasons for the development of drug-resistant TB. * The occurrence of HIV has been responsible for an increased frequency of tuberculosis. Control of HIV in the future, however, should substantially decrease the frequency of TB.